Rise to the challenge of completing higher education—prepare today for success you want tomorrow. I am currently working as a senior systems analyst for a large school district, and I am being considered for an administrator-level position. I work with many managers and directors who went back to University of Phoenix to get a master’s or doctoral degree so that they could go after positions within the organization that required those degrees. Our curriculum is created by subject matter experts in partnership with over 70 major employers. We regularly review and update our material to ensure it is current and up-to-date. This ensures that our students have relevant skills that matter in today’s job market. Over 70 percent of our students are considered non-traditional. This means they are already balancing a busy life as a parent, working professional or both. We understand the challenges you face which is why we offer classes online or on-campus at select locations. I took the hybrid program. It combines both classroom and online. You attend the first and last class on campus, and then the rest is online. It was nice because we were able to meet each other and the instructor, but didn't have to travel every week. As a student, I found such value from having faculty who were practicing their profession during the day and teaching us at night. It moved the learning far beyond theory to practical application. I (currently) teach 10–14 courses per year and feel professionally fulfilled and feel I’m doing my part in succession-planning for the next generation. Our instructors have an average of 21 years of professional experience. They have worked hard to earn positions of leadership and respect within their fields. When you are a Phoenix you get the benefit of their skills, expertise and hands-on experience. We were among the first to recognize the potential of online education. Our commitment to innovation and to our students has allowed us to offer higher education to students from over 115 countries. We put academic achievement in your reach with classes that fit your needs and your schedule. Our graduates make up a large community of professionals who work in various industries around the world. 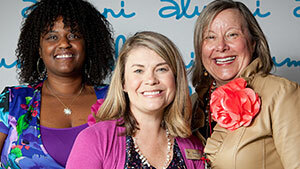 They are a part of our thriving alumni association, mentor program and social networks. Learn from and be encouraged by their support and tales of success.